Simulated path of progenitor satellite projected onto image. Mouse over to view simulated satellite path. 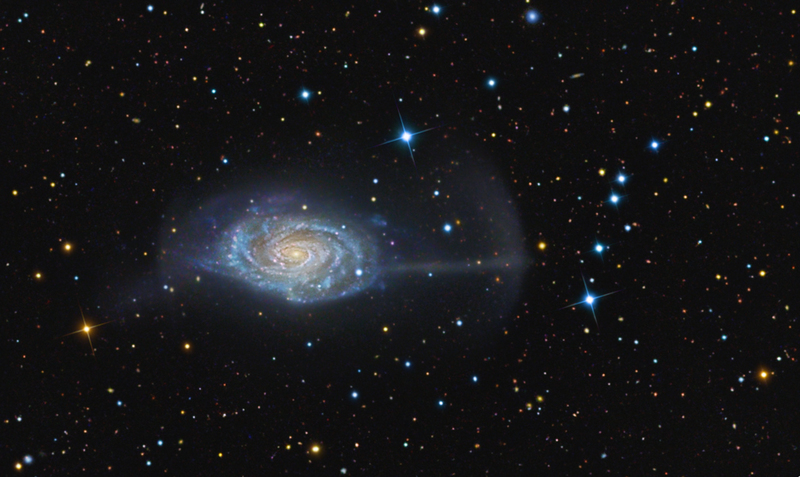 The Umbrella Galaxy (NGC4651) is the first in a series of new full color images that will be released during Spring and Summer 2010. These views of selected galaxies highlight the results of a productive collaboration between private and professional astronomers, led by Dr. David Martinez-Delgado (Max Planck Institute for Astronomy, Astrophysical Institute of the Canary Islands) This project was dedicated to exploiting the scientific potential of modest aperture telescopes. The standard cosmological model predicts galaxies grew and evolved hierarchically though a process of mergers that followed the Big Bang. Since evidence of this consolidation should be observable in galaxies located near the Milky Way, the team's investigation sought to uncover previously unsuspected stellar streams. NGC 4651 is one of the most remarkable and the brightest example so far detected in the team's ultra-deep pilot survey of selected isolated spiral galaxies in the Local Volume. This new view of the galaxy exhibits a jet­like spear that's strikingly coherent and narrow. The structure was previously reported by Boris Vorontsov Velyaminov in 1959 but never interpreted as a stellar tidal stream. Moreover, this deep image additionally shows a spectacular crescent shaped shell surrounding the east side of the star system that corresponds to the apocenter of the dwarf galaxy. Interestingly, a possible second arc on the western side of the galaxy can also be seen in this image. This feature is less obvious because it's partially hidden by the galaxy's disk and suggests we are observing a moderately inclined structure projected into the halo of NGC4651.